Interviewed by the TTV Main Channel Taiwan. The reporter wearing in Furisode Kimono which is a high class Kimono with golden and sliver embroideries. It is the most traditional Japanese style Kimono. Walking through the streets of Asakusa with much attraction of surroundings. Looked like a super star of attracting many foreigners took photos together. 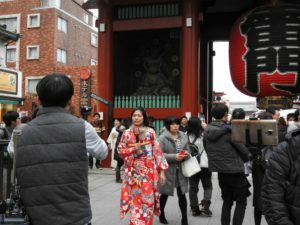 Experience of wearing Kimono walking in Asakusa. Enjoy an unforgettable memory for a vacation! This TV program will be played in the middle of December by the TTV Main Channel Taiwan. We are a Kimono shop that follows Japanese traditional heritage but adds in modern fashion sense, and there has been wide media coverage on us.